A political earthquake has been triggered in Thailand with the nomination of princess Ubolratana Mahidol as a prime ministerial candidate for March election, overturning a Thai tradition that the royal palace plays no public role in politics. Leader of Thai Raksa Chart party Preechapol Pongpanich, center, holds a picture of Princess Ubolratana at election commission of Thailand in Bangkok, Feb. 8, 2019. FILE - Thai King Bhumibol Adulyadej, center, is surrounded by his family members, left to right, Princess Somsavali, his daughter Princess Ubolratana, his daughter Princess Chulabhorn, Princess Siribhachudabhorn, Royal Consort Princess Srirasm, his grandson Prince Dipangkorn Rasmijoti, his son Crown Prince Vajiralongkorn and his daughter Princess Sirindhorn after addressing the crowd from a balcony of the Ananta Samakhom Throne Hall on his 85th birthday in Bangkok, Dec. 5, 2012. In a statement Friday, Thai Raksa Chart said Princess Ubolratana's official royal status remained revoked — allowing her to participate in party politics — but did not address Article 112. 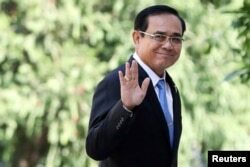 FILE - Thailand's Prime Minister Prayuth Chan-ocha gestures as he leaves after a meeting at Government House in Bangkok, Thailand, Jan. 24, 2019.